A luxury private villa with 3 bedrooms and 4 bathrooms. A private heated swimming pool is for all to enjoy at this truly wonderful holiday home. Relax on the roof terrace in the 5 seater jacuzzi and watch the wonderful sunsets, the villa is fully furnished throughout and comes complete with every modern appliance. Air conditioning throughout is another feature of this property. Luxury 3 bedroom 4 bathroom villa with private HEATED SALT WATER swimming pool. The ONLY SALT WATER swimming pool on BAHIAZUL. That promises 28c ALL YEAR ROUND. This beautiful villa is a fully equipped holiday home which is located on a private development. The villa comes complete with full air conditioning and a fully fitted kitchen. Dining room / lounge with TV DVD and an iPod station. Free Wi-Fi, UK and EUROPEAN TV. The pool terrace has a quality range of loungers, tables and chairs. On the roof terrace there is a pergola with table and chairs. There is also a wonderful 6 seater jacuzzi and loungers on the roof terrace. Guests at the villa can also benefit from the superb on site facilities which include a Bar, Restaurant, Gym and Sauna. 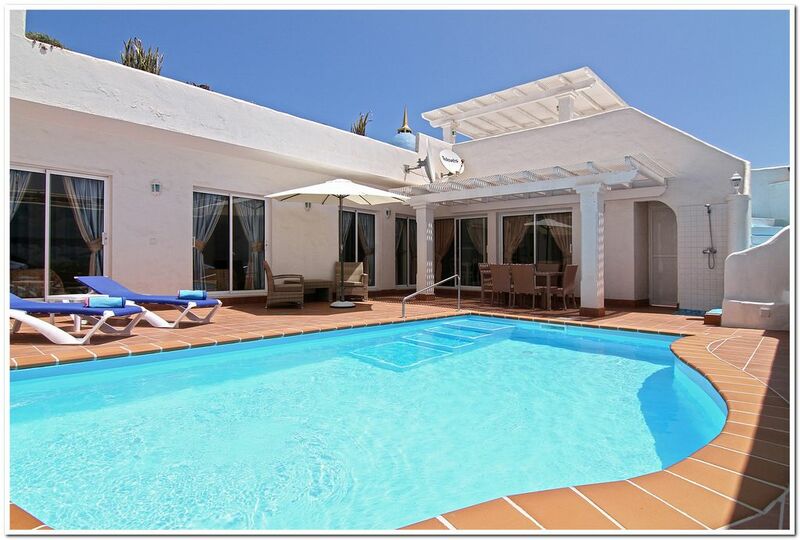 The villa is in a peaceful part of Corralejo, yet only 2 minutes by car from town and the wonderful golden sandy beaches. FLIGHTS TO FUERTEVENTURA: There are a number of airlines which fly direct from the UK. CAR HIRE: We would suggest using www.cicar.com This car hire company has a modern fleet and is located at the airport and in the centre of Corralejo. WHAT YOU SEE WITH OUR VILLA'S IS WHAT YOU SEE WHEN YOU ARRIVE. A NUMBER OF OWNERS ON BAHIAZUL HAVE SIMPLY USED THE SHOW HOME PHOTO'S, SO BE CAREFUL!!! There is an iPod station in the lounge. Smoking is not allowed inside the villa, however we have supplied ash trays for outside use. Smashing villa with everything you could wish for and more. Pictures hardly do it justice. A short distance out of town in a pristine development with it's own restaurant. Another highly regarded restaurant 10 minute walk from villa. 5 Euro taxi trip into town. Supermarket 2 minute drive from villa. Easy booking process with the helpful owner. Lucky enough to have experienced this sort of holiday many times in various locations around the world - Villa Victoria rates very highly. I would like to thank you for your review, and i am very pleased that you enjoyed your stay in Villa Victoria. It is always nice to know that our guests have had an enjoyable holiday. I hope that we can welcome you again in the not to distant future. We booked Villa Victoria back in August 17 to treat our daughter for her 18th Birthday in March 18. I cannot recommend this villa enough. This is the first time we have ever privately booked a villa and I was apprehensive as you hear so many bad stories when privately booking. Alan was very helpful, understanding and responded to email queries on the day, which put our minds at ease. When we arrived we contacted Paul as instructed on how to gain access to the Villa. He was responsive and very helpful too. We were also able to stay at the Villa longer than the normal time to leave, due to how late our departure flights were to come home. Upon arrival at the Villa we were more than impressed. The pictures do not do the villa justice... Even thou the pictures look amazing, to actually see in person was incredible. The villa had everything we needed and more. Every utensil you can think of was there along with the nice touch of bottle of wine, milk, crisps and dips to start the holiday and ample amount of towels. The villa was immaculate and extremely well kept and clean. The TV package/Internet was better than we have at home. Every channel you can imagine, sports, movies, entertainment, children's channels etc.. The villa has it all. We did have to work on some days, and to have the reliable and speedy internet was the cherry on the cake for us.. I really could write a book on how incredible and amazing our holiday was and extra special for my daughter's 18th. To top it off the weather in the day was very hot considering it was March.. Thank you once again Alan for your time you spent talking to me and reassuring us before we arrived. I cannot WAIT to return for three weeks next year in the summer. I am so pleased that you found our villa exactly what you had hoped for when you made your reservation. We do our best to make sure our guests have as much an enjoyable time as possible when on holiday. Our villa managers ( Paul and Kristy ) are great, and they will do everything they can to look after you while you are at the villa. We look forward very much to welcoming you again on your next visit to Corralejo. As frequent villa stayers, we generally know what the standard is for what you pay. We are half way through a relaxing break at Villa Victoria, and by golly what a lovely villa we are staying in!! As we are self employed we have to book at short notice when our diary's allow us, so we literally booked days in advance and the communication was first rate. Alan replied within hours of our first correspondence, and then within minutes of our follow up mail. The booking, the emails the calls were effortless and easy. The welcome email & directions were perfect. On arrival, I have to be honest I expected it to be small and not as impressive as we were on a row of about 10/12 villas, when we opened the door, MY GOODNESS, WHAT A TREAT. as with most villas, a kitchen, diner & living area were all standard on entry, but as soon as you opened the patio doors (2 to every room) you were greeted with a fantastic sun trap with a beautiful pool, it suited us perfectly as we enjoy our music and as we were so enclosed it couldent be heard by neighbours. Climb the steps and you are greeted with a brilliant roof terrace with sun-loungers, tables & chairs and brick BBQ (with coals) and a fantastic hot tub. All in all this villa is brilliant for us. The town is about a a 40 minute stroll or less than 5 euros in a cab. Could do with a full length mirror. Couldn't get the TV working, but to be fair we just hooked up our tablet to the TV. Bed wasnt in keeping with the rest of the villa, not really comfortable for us. I highly recommend this villa for a family of 4 or 2 couples who want to get away from it. I am very pleased that overall you like the villa and it's facilities. We do try to make sure that the villa is as much home from home as possible. I also take note of your comments regarding the full length mirror, and this will be sorted. We have also just ordered a new TV system, which will make the operation easier, and will include UK TV, SKY etc. I hope that you continue to enjoy your holiday, and hope to welcome you back on a future visit. Everything possibly needed is provided, home from home! The villa and surrounding areas was very clean as was the pool and jacuzzi! Great family holiday! Alan and agents Chris and Janet are great, very accommodating. I am very pleased that you and your family enjoyed the villa, and had a great holiday. I hope that when you return to Corralejo you will allow us to welcome you and your family to our villa again. Villa Victoria was fantastic and I would highly recommend. From the first enquiry Alan the owner was fantastic and put me at ease. The instructions for the villa was great. The villa is a short taxi ride from the strip which it cost 5.00 euro. The villa is great and we had great days around the pool, fun in the hot tub and a bbq. Everything you need to get you started in a villa we got wine and biscuits which was a nice touch. We have never done a villa holiday before but will doing one again and maybe returning for a second time. The rooms are brilliant as they all have en suites. We had an issue with the air con whilst we were away and the managers were fantastic. Top holiday, top villa!!! We will be returning. We recently returned from a 2 week stay at this villa with our 2 teenage children and have to say it was one of the best holiday villas we have stayed in. The description was completely accurate in fact it was better than described. Obviously the WiFi was a big hit with the kids, the salt water pool made a nice change from chlorine soaked eyes and the hot tub was a dream for all. We had 2 “minor” issues one of which was the pool was not completely clear for the 2 weeks we stayed due to a sand storm that happened the day before our arrival although the local manager did clean the pool twice. The other strange thing we found was that the 3rd bedroom could only be reached from the pool – no interior access – fine for our teenage daughter as it can be locked from the inside – but that was our other issue that the lock did not work but again not a major issue that spoiled the holiday in anyway. The on-site restaurant provide breakfast and dinner and is well worth a visit as the quality of the food and service is exceptional. Although the buffet breakfast seem a little pricey at €14 per head it is worth every cent. Corralejo is a 10 minute drive to the main strip where you will find plenty of shops and restaurants – the beaches and dunes are well worth a visit – but beware if you have children as naturists are allowed on some beaches! Corralejo is a wonderful place for holiday makers of all ages. The all year round climate is superb if you are looking for a summer or winter break. The beaches are amongst the finest in the world, with golden sand and clear turquoise seas. The old town of Corralejo is full of superb local restaurants offering a wonderful selection of international and local dishes. The main street has plenty of traditional bars and restaurants, with most of them providing evening entertainment. Corralejo has plenty for families, including Water parks, Ten pin bowling. Amusement arcades, Boat trips, Surfing, Sailing, Fishing, Market days, Shopping centres etc. Golf: There is a 9 hole golf course just 5 mins walk away. A 10% deposit is required with booking. Balance will be due 8 weeks prior to arrival. ***SPECIAL OFFER*** ONE COUPLE ONLY PRICES OFF PEAK FROM £995 PER WEEK... PLEASE ENQUIRE. .